In an extremely surprising announcement, there will be an official 2013 Rugby League World Cup video game released on Xbox 360 and Playstation 3. The game will be released on November 21st and is available for pre orders NOW! This news has come out of the blue. I’ve not heard a single thing about this game being in development until its announcement. Rugby League games have been a bit hit and miss in the past. Hopefully this game is an upgrade over previous Rugby League games which have ranged between passable to complete rubbish. Rugby League fans can now celebrate the largest Rugby League event on the planet with the official and exclusive licensed video game for Rugby League World Cup 2013. 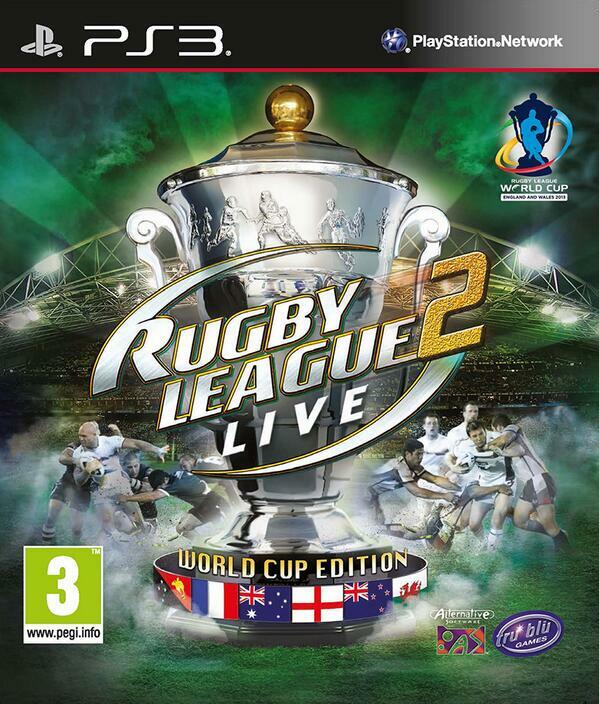 Experience all the emotion and passion of the world’s fiercest national rivalries as you lead your nation to glory at RLWC2013 in ‘Rugby League Live 2 – World Cup Edition’. Rugby League Live 2 – World Cup Edition features all the fun and excitement of the highly successful Rugby League Live 2 game plus new content, including an all new Rugby League World Cup 2013 Competition mode, with official RLWC2013 stadia and national teams, and an expanded 25-year 2013 Career mode to give you the complete Rugby League World Cup 2013 experience. Rugby League World Cup 2013 Competition: Compete as one of 14 teams from qualification right through to a virtual reproduction of the Rugby League World Cup RLWC2013 Grand Final. Play in any of 16 official stadiums. Experience System: Earn badges and experience both online and off to rise to the top of the leader-boards. Competitive or Co-operative: Multiplayer matches with up to 8 players (4-a-side) online. The game will be released on November 21 and is available to pre-order now. If I can get my hands on a copy I will preview the game. It will be interesting to see if they have made any updates to the graphics and in game mechanics. Like most Rugby League games I’ve played there has always been potential, but the finished product always seems cobbled together. As this will be the last Rugby League game released on the current generation systems, and with next generations consoles requiring very high production costs in terms of the high definition graphics used, this may be the last Rugby League game we see for a while. Hopefully its a good one!